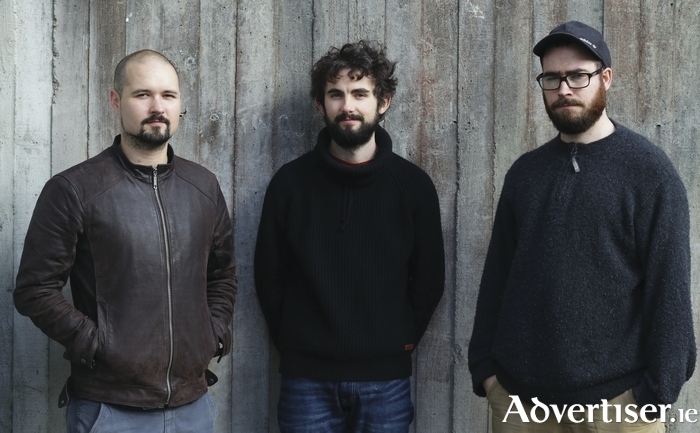 GALWAY POST-rock trio Zinc, whose music is "capable of knocking an audience clean off their feet" according to The Thin Air, launch their eponymously titled debut album on Thursday October 6 at 8pm in Biteclub, Abbeygate Street, as part of the Galway Jazz Festival 2016. The seven track album showcases the diverse sound created by Aengus Hackett (guitar ), Andrew Madec (bass ), Simon Kenny (drums ), which mixes atmospheric prog-rock, gritty hip-hop, and the more melodic side of electronica into an enticing whole. Speaking about the band's creative process, Aengus said: "We improvise at every rehearsal and this forms the core of Zinc's writing technique. It then becomes a process of refinement, taking the best ideas from the heat of the moment and working out the stronger patterns hidden within, with a slightly nerdy attention to detail." Recorded in Wicklow with Rian Trench, the album was produced with the help of Galway City Arts Office, which awarded Zinc its Band Grant in 2015 and 2016. "Making the album was really incredible," says Aengus. We worked with Rian Trench for three intense days to record it. My favourite tracks are 'Bling Bling' and 'The Mule'. You can hear our mixed influences on those, everything from hip-hop and hard rock to wonky electronica. The crazy wildcard on the album is 'Heat Death of the Multiverse', which came about at the end of a 13-hour day of recording, when we were just totally spent. We decided to do one last jam and just went for it! It sounds like a drum'n'bass DJ losing their mind in one last epic rave."